Alan Bonnici was walking the banks of the Maribrynong river flicking a range of soft plastics. He stumbled upon a school of Mullet that eagerly took curl tail soft plastics with nearly every cast which was lots of fun. Alan kept moving on and then landed 2 bream 15 minutes apart both around 39cm with the Savage Pro Grub in pink. 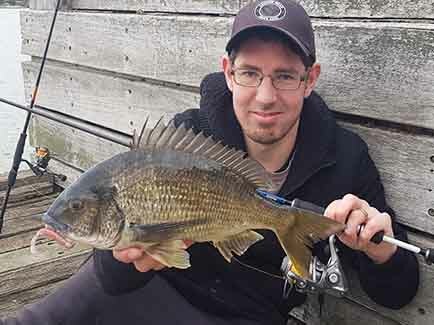 Its great fun catching big bream when using the very lightest of fishing gear using his LRF 1-3 kilo fishing rod and 4 pound braid.